When someone mentions cleaning up the garden you run off to look for your best gardening gloves so you don’t miss out on all the fun, but if someone mentions cleaning the house, you run off to hide wherever it is that you last left those gloves. You don’t see dust on the end tables for weeks on end until a mischievous garden fairy can write “clean me” in it, but when you see dust on a house plant, you immediately find a damp cloth to clean the plant. Bonus points if it is a really big plant and you lug it to the shower to hose it off occasionally. You wouldn’t dream of only mowing half the lawn and then leaving the mower out for several days right where you left off, but you often, generally, sometimes vacuum half the house and then leave the vacuum cleaner in the middle of a room for a few days before you finish vacuuming the rest of the house. Bonus points if the reason you stopped vacuuming was because you noticed the rain had stopped and you had to get out to the garden. You have a sign somewhere in your house that says something like “Sorry about the house, I garden” to explain why there are always little bits of leaves on the floor that you bring in from the garden on your shoes but can never find time to sweep up. You have to get a rake out to clean up the leaves that fall off some of the houseplants onto the carpet. Bonus points if you blogged about indoor raking. Oops, did I really do that? You are tempted to hire someone to clean for you but would rather just live with a slightly unkempt house so you can use that money to buy plants. The only time you seem to get around to mopping the floors is when you get distracted while watering house plants and end up accidently watering the floor. Thirty minutes of cleaning seems like an eternity but thirty minutes in the garden seems like a good start to a great day. You think nothing of working in the garden all day to the point of sheer exhaustion with sweat streaming down your face but when you are inside cleaning you convince yourself that you deserve a break when the first bead of sweat shows up on your brow. You have more hoes than brooms, vacuum cleaners, and sweepers combined. 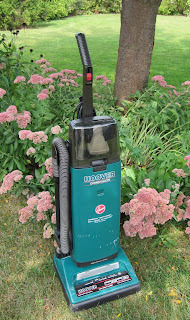 Bonus points if you have ever taken your vacuum cleaner outside to take a picture of it to post on your blog. Based on the above list, it would seem that Carol’s house is not a very clean place. Actually, by adopting a clean as you go approach, the inside of the house never gets all that dirty that a few minutes of cleaning doesn’t get it back in pretty good shape. Thank you. LOL! I have to get me one of those signs! I'm not quite that bad, but most of those hit the mark. My house would be a lot cleaner if it was only me leaving shoes by the door & dishes in the sink. Phyllis Diller used to offer that tip...about leaving your vacuum cleaner in the middle of the room, that way if anyone stopped by, it would appear as if you were caught in the middle of cleaning. Guilty as charged. Especially the part about little bits of leaves everywhere(but the dog does help with that). Instead of spring cleaning, I like to do my deep cleaning in the off (winter) season. That seems to make the most sense as a gardener. I can relate to bringing bits of leaves in on your shoes or blades of cut grass. Who has time to sweep that up with all the harvesting and preserving that needs to be done. I like to pretend I don't see it. Yes, I can say I have done most of this. My house work always comes last. Luckily I am not a total slob in the first place. My Mother used to say she could tell my mood by how the house looked. Hmmm what ever that meant. I often wonder what she would think of this garden. Oh, boy. You've got me pegged. Especially this one. "You are tempted to hire someone to clean for you but would rather just live with a slightly unkempt house so you can use that money to buy plants." I don't think my garden is much neater than my house but I spend a lot more time caring for it than I do housekeeping. I don't even pretend that I houseclean during gardening season. It's strictly an off season activity. Good thing I've got my kids trained. I need one of those signs too. It's hard to get a house messy, other than dust and leaves, if you stay outside all the time...do you eat? I defintely resemble this post! And outside, the vegetable patch is always tidier and better weeded than the flower bed. And since we have such a long gardening season here in Central Texas, that means my closets and junk drawers are a wreck by now. The house is usually kept up, but I almost stop cooking dinner in about February so I can spend quality early evening time in the garden! I need a rainy day, not just for the garden, but to clean out my pantry! I have the added advantage of being a man, so nobody really expects me to have a super clean house. I indeed have more gardening tools than housekeeping tools. Always look forward to your posts to lighten the day. I am a great believer in you house keeping/gardening philosophies. All the points are true. Except for the fact that I don't have indoor plants. Therefore, I never accidentally water the floor... therefore, I never mop... you can see where this is going, can't you? I've used a rake to clean my boys room. Sad but true. Ha ha ha! I am laughing hard at this one because I am so guilty of so many of these. I even tried training the baby to clean the houseplant leaves from the carpet as a good "learning experience", freeing me to do other houseplant chores (while avoiding the dishes, etc.). Yes, I do have the sign too. "Gardening forever, housework whenever." Well, I'm glad to join the clan of gardening geeks. I have done ALL those things! Especially the part about leaving the vacuum cleaner out, in hopes that seeing it sitting in the middle of the next room to be vacuumed will motivate me to do that. Fortunately, I am always able to find something else out in the garden that needs doing more. I don't even have that many hoes, but I definitely have more of them than vacuums and brooms, as I only have one of each. Why have more than one broom? You can't use two at once, and if you have two then you have to store them both. And money used to buy a broom could have been used to purchase something garden related, as you so properly pointed out in your section on possibly hiring someone to clean for you. What a wonderful and funny post! Very happy I found your blog! The funny thing is....I've never been in your house and not found it to be clean enough to eat off the floors. Your house always look nice and neat, but so do your gardens as well.